In the quest for innovative drug delivery systems attempting to meet the unmet needs in pharmaceutical space, research has taken a much more complicated path that poses a significant challenge for translation. Despite the progress made with novel materials, polyesters still remain at the helm of drug delivery technologies. 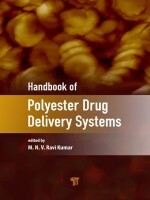 This book provides a single source of reference of polyester drug delivery systems that covers a broad spectrum of materials design, manufacturing techniques, and applications.